Dolphins have been a part of human history in the form of myths and folklore since practically the beginning of recorded time. The ancient Greeks worshiped dolphins, and in Greek law, it was illegal to harm a dolphin in any way. 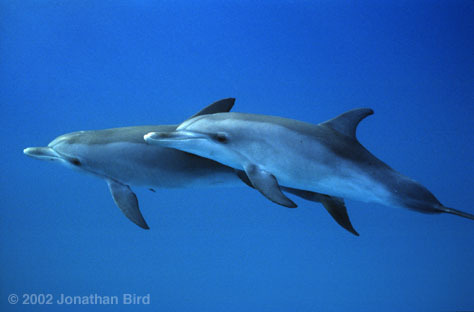 Perhaps because of the television series "Flipper," we identify dolphins as intelligent and friendly. In fact, there are stories in many different cultures from ancient to modern about dolphins helping humans. Research has shown that these animals are "social" animals, living together in groups called pods. Filmed completely in the wild, "Dolphins and How They Live" takes the viewer on a voyage to meet a pod of wild Spotted Dolphins in the Bahamas, to learn how they conduct their daily lives. Viewers will see how the dolphins hunt and eat, what they do for most of the day (play!) and learn about the dolphin's sophisticated form of sonar. This rare glimpse into the lives of dolphins as they take our film crew into their world, is an unforgettable and educational experience for children and adults alike.